Democrats listen to Mayor Weinberger's victory speech on Town Meeting Day 2015. When an organization helps out a cause, it usually welcomes recognition of its largesse. In politics, that's not always the case, and the Vermont Democratic Party is being coy about what it contributed to local Burlington campaigns leading up to Town Meeting Day. 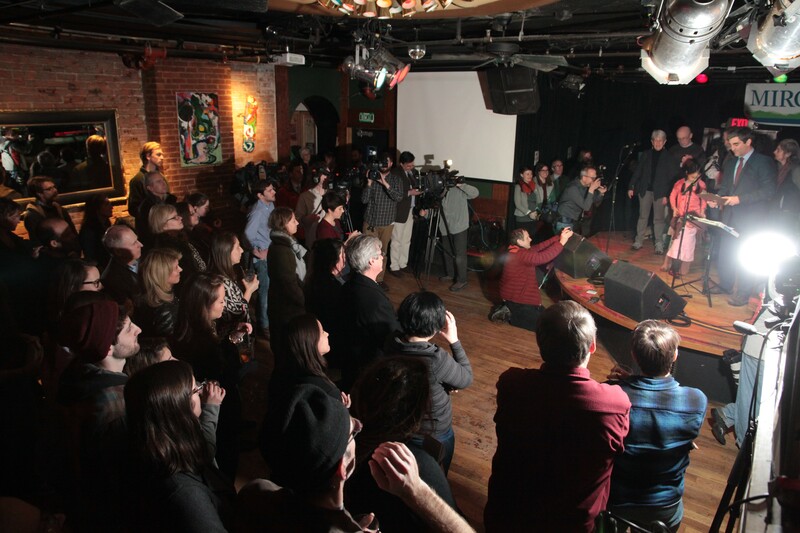 When Mayor Miro Weinberger delivered his victory speech at Nectar's on election night, he made a point of recognizing contributions from both the city and state parties. "I want to thank the Burlington City Democrats and the state Democratic party for the incredible effort that they organized... It was an awesome thing to watch and incredibly exciting to head down to College Street [Democratic headquarters] and see that kind of effort going down day in and day out. In both of the campaigns I’ve been fortunate enough to run in, we’ve had a huge piece of help from the Democratic Party, and I want to thank everyone who’s been involved in that effort." How huge the help remains unclear. The campaign finance report shows that the Vermont Democratic Party raised $20,641 during the election cycle, including a $10,000 donation from David Blittersdorf, president and CEO of AllEarth Renewables. It spent $44,255, but a large portion of the spending was money transferred to its federal fund, according to the VDP's compliance officer. The city party — known as the City Democratic Committee of Burlington — reported $4,015 in contributions. It spent approximately the same amount, doling out $250 donations to candidates Carmen George, Brock Gibian, Jim Holway, Tom Ayres, Chip Mason, Carmen Scoles and Sarah McCall. Ben Sarle, the Vermont Democratic Party's spokesman, refused to provide any further detail about the state party's involvement. "We contributed our skills where we could and that’s that," he said last week, declining to share how many staff worked on the effort or what type of support they provided. Sarle also would not say how the party's support compared to previous years. "I am not going to comment on that because I wasn’t around in previous elections," he said. He declined to make anyone else available to address the question. Democrat Tom Ayres won his race against Republican Michael Ly in Ward 7 by less than 40 votes. Ayres said the state party focused on races in Wards 3 and 8 and the East District, but also helped him significantly — by providing voter data, phone banking, coordinating a literature drop and canvassing. "I don’t think there's any question it made a difference," Ayres said. Volunteers coordinated by the party started phone-banking five or six weeks ahead of the election, according to Ayres. Unlike in past years, they continued to occupy their College Street campaign headquarters after the November election and up until Town Meeting Day. Compared to 2012 — when the state party pitched in significantly on Weinberger's campaign — Ayres said, "I would say they stepped up their level of engagement from that but not dramatically." Candidates who ran against Democrats certainly got the impression that the party played a much bigger role this time around. Dave Hartnett had been a Democrat but lost the party's endorsement to Carmen George at their January caucus. He won as an independent candidate. He said, "I think it was a huge effort on the part of the Democratic party to win some seats on the council." He noted that at the council level, "This is the first time I've witnessed this." Progressive Councilor Selene Colburn, who won against Democrat Carmen Scoles in the East District, said Democrats appeared to have "mobilized a very powerful network." But most notable, Colburn said, was the extent to which Weinberger went to bat for Scoles, making calls, accompanying her at the polls and issuing a lengthy endorsement on her behalf. Morgan Daybell, the vice chair of the Vermont Progressive Party, said Progs don't have the resources to play a significant role in city council elections. Neither they nor the Republicans filed campaign finance disclosures with the state during this election cycle. With the elections over, why are the Democrats keeping their cards so close to their chests? "It's nothing about not sharing. It's not a quantifiable thing," Sarle said, "As a state party, what we do is get Democrats elected." Democrats had mixed results accomplishing that goal on March 3. They returned four incumbents to office, two of whom won competitive races. But they lost five races in which new Democratic candidates were running. Sarle's partner, Sarah McCall, was one of the candidates. She lost a close race in Ward 3. The end result: Democrats lost their plurality on the city council.